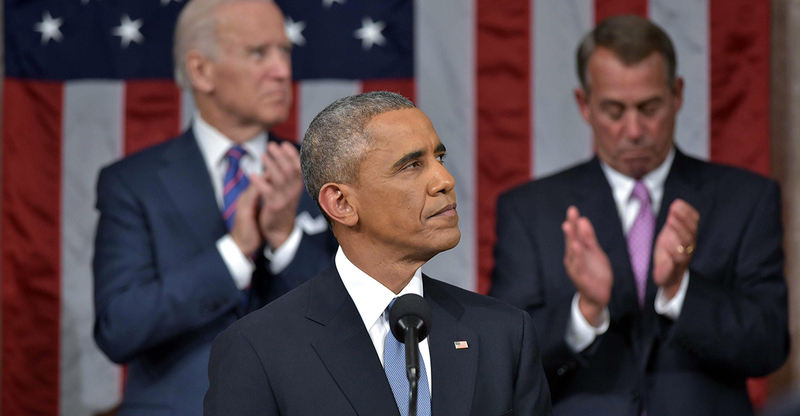 President Obama touted shrinking deficits in today’s State of the Union address. This is about the only time in the foreseeable future the president will get to say that. 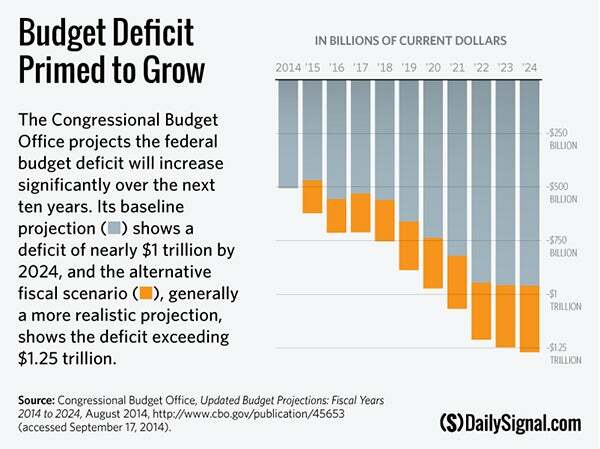 The average annual deficit over the next decade is projected at $950 billion, just shy of a trillion. Starting this year and looking out as far as projections go, the deficit–absent further policy changes–is only heading in one direction: Up. Why address chronic and rising deficits confronting the nation, when you can enjoy a talking point while it lasts? President Obama and his staff rolled out his plan to raise taxes on the rich and give targeted tax cuts to some middle class families this weekend. Surprisingly, he made little specific mention of this plan in tonight’s speech. He mentioned a significant increase of the child care credit, which only benefits families that choose to pay for care outside the home. Then he made vague reference to closing loopholes in the tax code, but gave little indication of which he’d like to see closed. He did make clear, of course, that he wants these undefined loopholes closed to raise taxes to pay for infrastructure spending. If loopholes are to be closed, tax rates should be lowered so as not to cause a tax hike. He did mention that he wants to see loopholes closed that allow businesses to keep foreign income offshore. This could mean many things, but is most likely ending deferral, which allows businesses to avoid paying the highest-in-the-world corporate tax rate until they bring their foreign income back to the U.S. We need to reform how we treat businesses’ foreign income, but Obama’s plan goes in the wrong direction. We need to move to a territorial system that does not tax foreign income, just like almost all other developed nations use. Lastly, he talked about raising taxes on wealthy heirs, which really means he wants to raise capital gains taxes on the rich. Far from soaking just the rich, higher capital gains taxes will hurt middle class and low-income families because it will slow economic growth. Policymakers cannot have it both ways. Tonight President Obama (rightly) lamented slow wage growth during the recovery. Just a few breaths earlier he suggested requiring seven days of paid sick leave for all employees. However, his proposal would cut workers’ pay by seven days a year. Fewer Hours Worked The president boasted about the economy’s success this year, but he left out a few crucial details. Employment has indeed recovered – but for many workers hours have not. Employees in the bottom quintile have had saw average weekly hours drop by almost 4 percent in the recession. Unlike workers in higher income groups their hours did not recover. This has cut their pay by an average of $500 a year. And starting this year the employer mandate now penalizes employers who hire low-wage workers full-time. For all that the president talks about improving the economy, his policies have made it worse. President Obama celebrated the fact that the economy created jobs at the fastest pace since 1999 . These figures are far less exciting news when put in context. 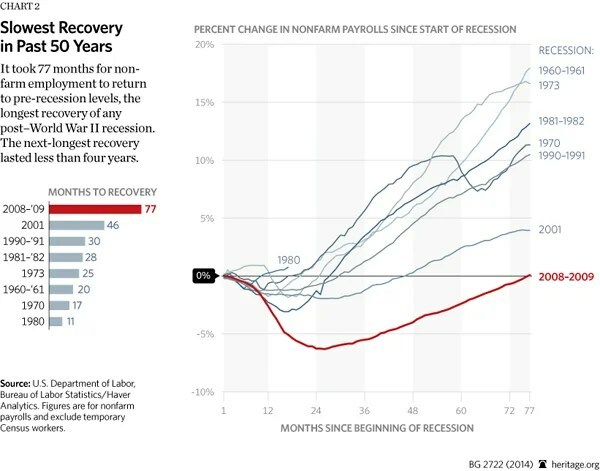 Americans have suffered through the slowest recovery of the post-war era. The recession started seven years ago. Only in mid-2014 did the economy recover the jobs lost during the downturn. Full-time jobs have still not recovered – the entire net employment gains since 2007 come in part-time positions. Furthermore, the Obama administration’s policies have contributed to this sluggishness. Half of small business owners cite taxes or government regulations as their single greatest problem. A delayed recovery certainly beats the alternative of even slower job growth. But the administration should hardly want credit for such an anemic recovery. President Obama touted the fact that unemployment has fallen to 5.6 percent. That’s good news. But he neglected to mention the fact that the proportion of Americans with jobs has changed little over his presidency. The vast majority of the improving unemployment picture comes from Americans dropping out of the labor force and no longer looking for work. In part that has to do with demographics—the ageing of the baby boomers means more retirees and thus fewer workers. But demographics only explain one-quarter of the drop in labor force participation. 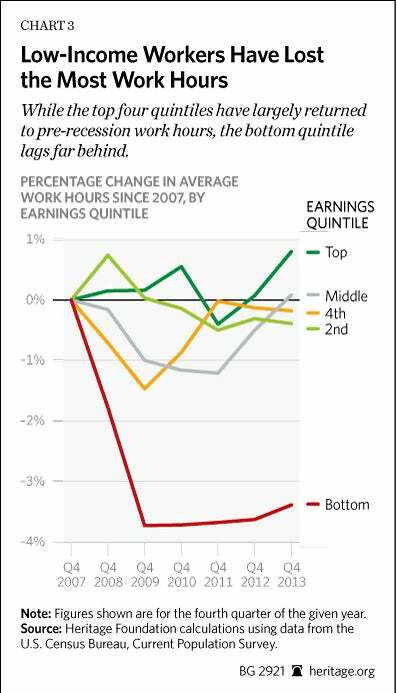 For many workers the economy offers less opportunity than it did before the recession. The official unemployment figures hide that fact. What about the Middle-Class Economics the President Omitted? A theme in President Obama’s address is the idea of “middle-class economics,” which apparently denotes the usual raft of progressive government-first economic policies. Central to his argument that his policies have worked is the idea that 2014 was “a breakthrough year for America.” Indeed, the economic recovery did finally arrive in 2014, or maybe even 2013. But why should policies put in place back in 2009 and 2010 get credit for the most delayed economic recovery since the Depression? 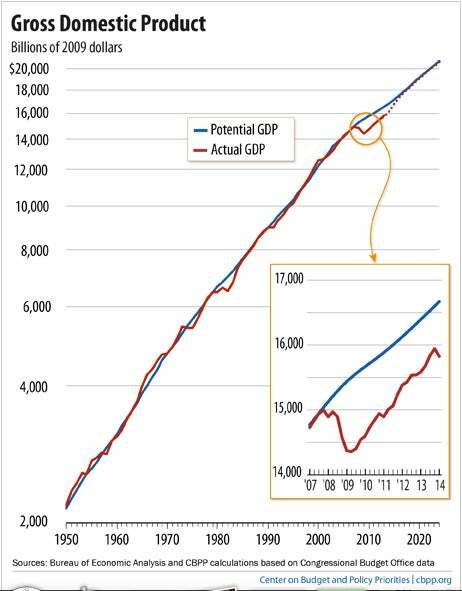 Compared to economists’ best guess of the United States’ economic potential, the recovery has barely narrowed the “output gap” since 2009. After previous recessions, the economy quickly got back on track. This recession and the policies undertaken during the delayed recovery seem to have done more permanent damage. Wage Growth President Obama summarized his economic agenda as “helping hardworking families make ends meet.” But instead of adding more top-down economic control, the government can promote real wage growth by removing regulations and taxes that keep prices high. 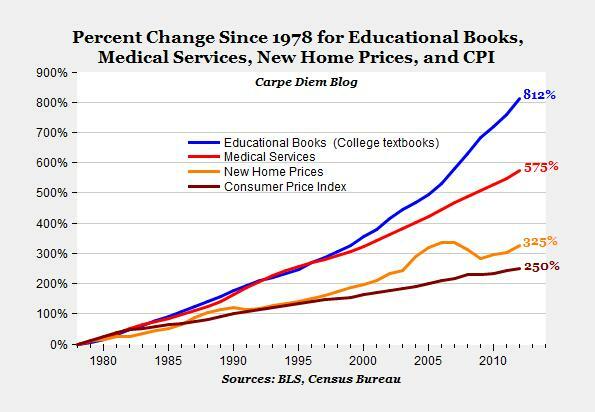 In the government-dominated sectors of education and health care, prices have risen much faster than wages over the past generation. Electricity and fuel are made more expensive by the Environmental Protection Agency’s “war on coal.” The Dodd-Frank financial reform raises prices by making it more difficult for small banks to comply with all the new rules. And land-use regulation and permitting processes make rent for families and businesses much higher than it could be. Instead of mandating higher wages (and fewer jobs), Obama could raise real wages by taking the lead in reducing costly regulations. President Obama speaks of federally-funded infrastructure projects (ports, bridges, high-speed trains, etc.) as if they were candy from Willy Wonka’s Federal Chocolate Factory: “We gave our citizens schools and college, infrastructure and the internet—tools they needed to go as far as their effort will take them.” It’s a statement that smells of the Keynesian economic policy of federal economic stimulus that has proved wrong repeatedly, most recently with Obama’s 2009 stimulus bill. And the president borrows from past State of the Union addresses by talking plenty of transportation infrastructure wants, but dancing over the specifics such as spending priorities, and how and who will realistically pay for the increased spending on infrastructure. No new ideas surfaced during his remarks. One suggestion—to pay for a multi-year infrastructure bill with revenue from corporate tax reform—is completely misguided. First, any revenue from corporate tax reform should go toward lower marginal tax rates, not new government spending. Over-spending is what has mainly gotten Washington’s Highway Trust Fund into trouble in the first place. Second, tying corporate tax reform to infrastructure project funding and financing would violate the user pays, user benefits system that has injected transparency and market forces into transportation policy over the years. To remove that—meaning road, port, bridge and other users don’t pay for want they get—is to remove accountability. Then after that is gone, any federal funding pot for infrastructure will become slush fund money, and politics, not the transportation priorities, will dictate how it gets spent. Finally, Obama revisits the worn out calls for a “bipartisan infrastructure plan” that will allegedly create thousands of jobs. As Heritage has written, such calls for more spending (and higher taxes to pay for the spending) “misunderstand the nature of infrastructure construction work…[which is]…capital intensive, not labor intensive.” Construction of a road or a bridge does not require teems of workers, but rather a small amount of skilled workers operating advanced machinery. In fact, the 300,000 Americans who work to construct highways, streets or bridges don’t even reach the population of Wichita, Kansas. What About Entitlement Reform, Mr. President? While the President proposed billions of dollars in new spending and taxes in his State of the Union address, he almost completely ignored one of the most enduring challenges faced in Washington: Entitlement spending. Spending on Social Security, Medicare and Medicaid takes up almost 50 percent of the federal budget and, along with net interest, is on pace to consume 100 percent of all tax revenue in only 15 years. The president stated: “It’s now up to us to choose who we want to be over the next fifteen years, and for decades to come.” It appears that the president has chosen that we will be a nation perpetually in debt. As the president praised the establishment of “Social Security, Medicare and Medicaid to protect ourselves from the harshest adversity,” he failed to address their unsustainable spending growth—a threat to their very viability. Gas Price Relief? Thanks. Gas Tax Increase? Not a Chance. Recent plummeting of gas prices at the pump has meant financial relief for Americans across the country. They have more money in their wallets to save, or spend on other priorities for their families. President Obama acknowledged “the typical family this year should save $750 at the pumps,” though some of that savings is attributed to harmful, costly fuel standards. So while Americans are finally getting a break, some lawmakers and special interest groups in Washington are calling for an increase in the federal gas tax. They want to spend more on pet projects and concentrate transportation decision-making in Washington. Some gas tax hike proponents even say that Americans may hardly even notice an increase. You didn’t build that, President Obama. Thank American ingenuity for low gas prices, high-paying jobs and increased manufacturing. Obama highlighted the fact that America is now the no. 1 oil and gas producer and Americans are saving a ton of money. He mentioned that manufacturing jobs are coming back to the U.S.
He’s right and it’s all great news. But it’s not because of the administration’s policies; it’s in spite of them. The price at the pump nationally is almost down to $2 per gallon. In fact, 25 states are now enjoying sub $2 gas. Households could spend less on gas this year than in the past eleven years. Along with consistently low natural gas prices, the energy boom occurring predominantly on state and private lands is putting money back into the pocketbooks of American families and lowering the costs of doing business. Not only is the domestic oil and gas industry far outpacing overall job growth, low energy prices are encouraging energy-intensive firms to flock to the U.S. Natural gas and natural gas liquids are important raw materials for many industrial processes, including manufacturing fertilizer and chemicals. Was 2014 Really the Warmest Year On Record? 1. There are plenty of greater threats to future generations than climate change. How about getting energy access to the billions of people without affordable and reliable electricity? 2. Satellite data shows that 2014 wasn’t the warmest year on record. NASA and National Oceanic and Atmospheric Administration did report that 2014 was the warmest on record but with low confidence. Berkley Earth, certainly not your climate deniers, said it was impossible to conclude whether 2014, 2010 or 2005 was the hottest year. Importantly, Berkley Earth’s bottom line is that “That is, of course, an indication that the Earth’s average temperature for the last decade has changed very little. 3. One year doesn’t make a trend, President Obama says. And he calls attention to 14 of the warmest 15 years on record being in this century. Here’s what he fails to mention. There has been no increase in global surface temperatures over the past 15 plus years, even as global carbon dioxide emissions increased and climate models projected there would be increases in warming during this timeframe. Climate models continue to stray further from climate realities. 4. Obama says he refuses to allow Congress to turn back the clocks on the administration’s climate regulations. But it’s the president who’s turning the clocks back on economic growth and job creation with regulations on energy that will drive prices higher for no meaningful climate benefit. Using a climate calculator and model developed by the Environmental Protection Agency, climatologists Paul Knappenberger and Pat Michaels project that the EPA’s climate regulations will mitigate 0.02 of a degree Celsius warming by the end of the century. These are not regulations that are helping future generations but instead giving them a less prosperous world to look forward to. The president’s call tonight to make community college “free” will serve as little more than a federal handout to the community college system. Low-income students already have access to federal Pell Grants, which can be used to finance their tuition obligations at a community college. And it’s a system in which just 20 percent of students who begin at a two-year community college complete their program within 3 years, according to the U.S. Department of Education. And only 20 percent transfer to four-year institutions. President Obama said tonight that he wanted “this chamber, this city, to reflect the truth.” And yet he made voting and civil rights claims that reflect anything but the truth but instead simply reflect false political talking points used by his political party. For example, the president claimed that “Congress stills needs to pass a law that makes sure a woman is paid the same as a man for doing the same work.” But Obama failed to mention that federal laws, including Title VII of the Civil Rights Act of 1964 and the Equal Pay Act of 1963, already require that a woman be paid the same as a man for doing the same work. In fact, the Civil Rights Act of 1991 makes employers liable not only for compensatory damages if they intentionally engage in discriminatory conduct, but also for attorneys’ fees and even punitive damages. The claim that another federal law is needed is just part of the supposed “War on Women” political narrative used to condemn anyone who is against passing an unneeded additional law to make illegal what is already illegal. The president only gives but a passing mention to Obamacare, his signature legislative achievement. However, the coverage gains touted by the president mainly reflect the expansion of the Medicaid program which has a long history of lower quality and limited access to care when compared to the private insurance and would still leave millions without coverage. Moreover, as shown by Heritage expert Ed Haislmaier, the vast majority of Obamacare’s coverage increase in 2014 was offset by the loss of coverage for those with employer-sponsored insurance. President Obama remarked tonight: “We still may not agree on a woman’s right to choose, but surely we can agree it’s a good thing that teen pregnancies and abortions are nearing all-time lows.” Indeed, the national abortion rate has plummeted over the past few decades and is now at its lowest level since the Supreme Court’s 1973 decision in Roe v. Wade that invented a constitutional right to abortion. That’s certainly something that both sides of the abortion debate should be able to cheer. While the causes for the decline in abortion rates are varied, commonsense laws over the past few decades that protect both women and children from abortion have certainly contributed. If the president truly believes that declining abortion rates are a good trend, then he should support legislation that would better protect the health of women and lives of unborn children, especially from dangerous and gruesome late-term abortions. Tonight President Obama discussed various policies that he believes will address the growing economic divide in our country. However, he continued his track record of failing to mention one of the greatest factors standing in the way of opportunity: the growing marriage divide. In a recent study, Dr. Brad Wilcox and Dr. Robert Lerman report that 32 percent of income inequality since 1979 can be linked to the decline of marriage. Today two-thirds of children born to mothers with less than a high school education and more than half of children born to mothers with just a high school diploma are born outside of marriage. In contrast, 90 percent of children born to college-educated women are born to married parents. This trend is creating a “two-caste” society “with marriage and education as the dividing line.” Marriage not only protects against poverty–children in single-parent households are roughly five times as likely to be poor–but it also protects children against several risk factors including child abuse, dropping out of high school, drug and alcohol abuse and becoming an unwed parent. President Obama’s new tax plan, which he discussed in part tonight, lays out new proposals that he claims would help low- and middle-income families. These included a new tax credit program for dual-earner families and an expansion of the Earned Income Tax Credit (EITC) program for single, childless adults. He also proposed a substantial increase to the child care tax credit. Unfortunately, Obama’s proposed policies do not deal with fraud, which is rampant in refundable EITC. Nor do his proposals address the problem of refundable tax credits (which are really cash welfare) to able-bodied individuals who perform little work. The president’s refundable tax credit for two-earner families and his proposed expansion of the EITC to workers without children and to absent fathers would make both problems worse. The Obama policies would also increase anti-marriage incentives in the welfare system. While the two-earner credit would reduce marriage penalties in some cases, the expanded EITC for non-parents and for absent fathers is larger than the two-earner credit and is blatantly anti-marriage. Absent fathers and other males would receive this new EITC credit only as long as they were not married. When they marry, the new credit would be removed. Overall the Obama policies increase rather than decrease penalties against marriage in welfare. Policy should seek to reduce marriage penalties, rather than take another strike against it. Why Didn’t Obama Mention Arab Spring? By not mentioning Arab Spring at all in tonight’s speech, President Obama missed a huge opportunity to advance the cause of freedom. For example, Tunisia, the birthplace of the populist uprising for greater freedom in the Arab world in 2011 and the gateway to North Africa, does matter to America. Tunisia’s ongoing journey to greater openness and transparency has resulted from the quest for the fundamental freedoms of property rights, trade and entrepreneurship that have driven the country’s bottom-up democratic transition. Noticeably missing from President Obama’s state of the union speech was any mention of al-Qaeda, the first time that terrorist network went unmentioned since George Bush’s 2002 speech. The president did mention ISIL (the Islamic State of Iraq and the Levant) — an al-Qaeda offshoot — in passing, but ignored the continuing threat posed by its al-Qaeda parent organization. This is a curious approach to take when al-Qaeda has in recent years established a stronger presence in Egypt, Iraq, Libya, Mali, Syria, Turkey and Yemen on the president’s watch and is poised to make a comeback in Afghanistan, if he follows through on current plans to withdraw all U.S. troops. It is also disquieting to remember that Obama also declared that he had “turned the page” on the Iraq war back in 2010. In 2014, the Iraq war came back with a vengeance, and Obama was forced to order the return of U.S. troops there. Last week, President Obama highlighted increasing information sharing between the public and private sector. Though further details will need to be hashed out concerning the specifics of his policies, the White House should be commended on taking the initiative to complement existing cyber security. 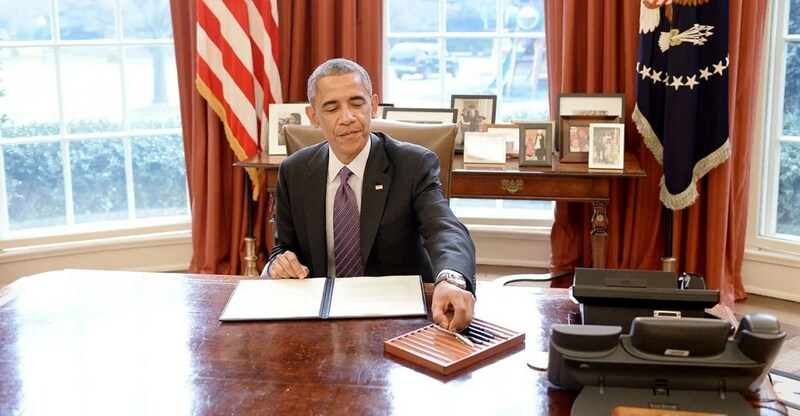 Obama first introduced his cyber policies last week while touring the Federal Trade Commission and National Cybersecurity and Communications Integration Center. While experts have long advocated for increased information sharing, past proposals often lacked adequate measures for protecting companies from legal liability. Information sharing is a key measure to increased cyber security. The sharing of cyber threat information from a company that has come under cyber attack, or from federal agencies that perceive a growing cyber threat, helps other companies prepare for and mitigate such threats. Yet companies have voiced concerns over information sharing, as the information shared may contain information that could become detrimental to a companies’ future if abused by outside parties or by government regulators. A balance between the time it takes to share, and quality of information shared, will need to be addressed in order to expand the rate at which information is shared, but there’s no guarantee all non-pertinent information may be removed by companies before sharing. That is why liability safeguards for information sharing should be implemented for companies, and information for the sake of increased cyber security shouldn’t be used by regulatory agencies or company competitors. Obama mentions a targeted liability system, and though details still have yet to be released, this seems to fall short of the strong liability protection businesses will need to share information without fear. President Obama tonight displayed an almost touching faith in the power of quiet diplomacy to solve problems in a dangerous, complex world. If only it were so well. The president’s speech contained several references to diplomacy. He described America as leading “with consistent and strong resolve.” For most observers of Obama’s U.S. foreign policy, that description that is almost unrecognizable. Obama talked about smarter U.S. leadership and stronger diplomacy, about not talking rash decisions, about war as the choice of last resort. Rejecting the idea of sending troops into war zones like Iraq and Syria, he said he intend to “stand on that wisdom” of not putting boots on the ground. The president also said he considered climate change to be the greatest challenge and national security threat for future generations. For those who follow the news from the Middle East and the unraveling of terrorist cells in Europe, climate change is an almost quaint choice. The speech spent all of two paragraph on terrorism and did not mention al-Qaeda.